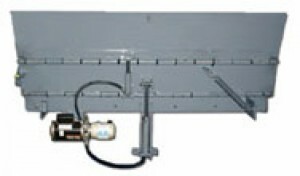 Edge-of-Dock MD-CH Series Hydraulic | Dock Door Systems Inc. The MD-CH Series hydraulic edge-of-dock leveler from Blue Giant is ideally suited for applications where installation of pit levelers is not feasible or where standard fleet bed heights are serviced at the loading dock. The MD-CH Series is easily installed to the dock face providing an efficient self storing docking unit, with ease of use at the touch of a button. Deck and lip operation provided by dual hydraulic maintenance free cylinders. Grease fittings to minimize operational friction. Optional grip handle for use as maintenance stand (shown). Cylinders and motor pre-fitted to edge-of-dock assembly. Lifting hole in lip allows for quick and easy handling by installer. Deck and lip plates made of premium grade 50,000 psi minimum yield four-way diamond tread plate. Heavy-duty 3/8” x 6” back beam. Two (2) molded rubber bumpers bolted onto heavy-duty steel block extensions, to help protect building and dock from damage.